The UK branch of one of the largest retailers in the world - Amazon.com - came out with an Android app today, dedicated to the UK market. The app is very similar to the U.S. version and offers convenience and speed of a locally installed application over browsing amazon.co.uk and having to keep track of your logins. Barcode scanning, 1-click ordering, prime membership, wish lists, recommendations, customer reviews, order tracking and modification are all supported. Note: The app is geo-coded and therefore not available in Markets outside the UK. Luxembourg – January 26, 2011 – Amazon.co.uk today announced the release of its latest mobile shopping application, “Amazon App for Android™,” which is now available as a free download in Android Market™. Designed specifically for Android, the Amazon App offers users a fast and convenient way to shop for millions of items on Amazon.co.uk and thousands of Marketplace sellers wherever they go. The application includes barcode scanning, a new feature that enables Android users to use their device camera to scan items available for sale on Amazon.co.uk and receive a product match instantly– without the need for a keyboard. 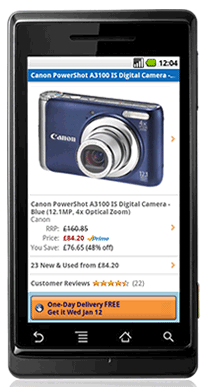 Using the Amazon App for Android, customers can make price comparisons across multiple sellers, and easily purchase products from Amazon.co.uk and thousands of other retailers on the Amazon.co.uk site.